Happy Easter to you! As you are watching the little ones hunting eggs, sharing family stories over breakfast, and diving into your Easter baskets keep a smile in your heart. Keep traditions alive and well, and make new memories. Take copious amounts of photos, and savor every morsel of chocolate. Enjoy the spring air, and newly budding trees that will soon be lush and green. More than anything drink it all in and be truly happy! I suppose I could stop being so chatty and tell you about my card huh? The card base is a combination of rounds and scallops layered over and over. 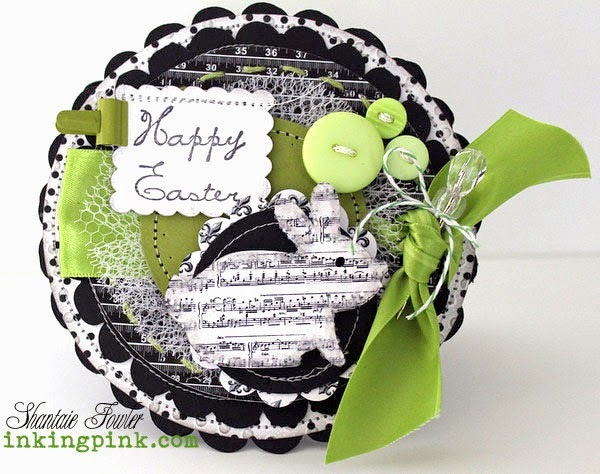 The bold green and licorice palette is not your traditional "go to" Easter mix, but I just love how it pops! The bunny was cut with the Teresa Collins Easter cartridge from a small music print paper. I actually made this card almost 2 years ago for the Cricut Circle and didn't realize that I hadn't shared it with you yet!